You know you’re hosed when it takes you a week after classes start to write about your classes. Seriously, look at this mess. 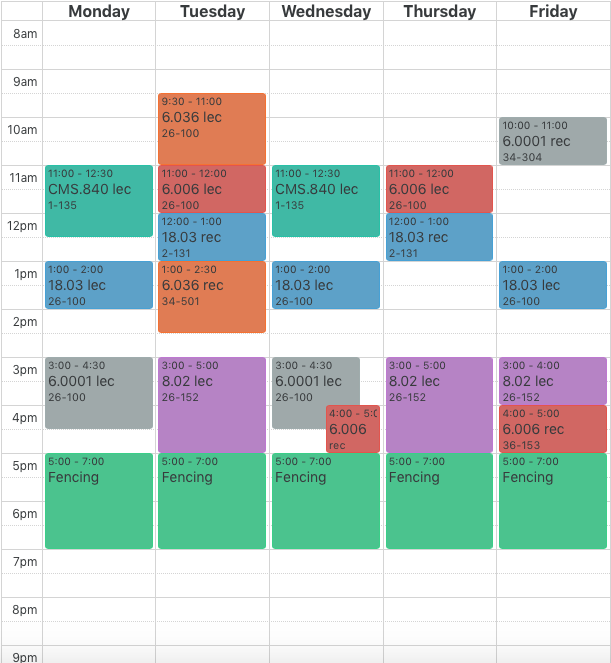 6.036 – Intro to Machine Learning: I’m pretty excited for this class, both for the material and because I have a lot of friends taking it with me. 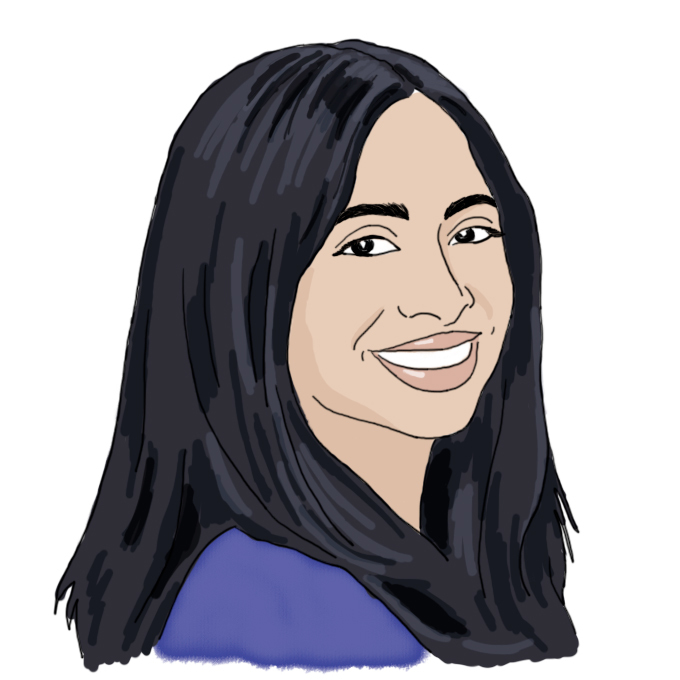 I also really like the way the class is structured – essentially, I go to lecture Tuesday morning and learn the material for the week, then go to lab hours in the afternoon and work through a sizeable chunk of the pset. In other words, I don’t have to spend that much time outside of class on homework, which is everything I could ask for from a class this semester. 6.006 – Intro to Algorithms: I’m taking this class on Sophomore Exploratory (one of the benefits of getting sophomore standing is that you can get this status early), which basically means that if I do bad in the class, it won’t appear on my transcript. 6.006 is notorious for having time consuming psets that involve a lot of algorithm analysis and proof writing, but it’s also a required class for my major, so I’m going to do my best and hope for the best. 8.02 – Physics II (Electricity and Magnetism): Every time I attend this class, I’m reminded of just how much E&M I’ve forgotten since I took it in high school. I’m terrible at understanding concepts in this class (you can see a ball rolling down a ramp in mechanics, but you can’t see an electron whizzing around in space in E&M), but it’s been pretty easy so far, so I’m going to keep my fingers crossed. 18.03 – Differential Equations: For whatever reason, MIT smiled upon 18.03 students this semester and assigned Bjorn Poonen (this guy) as our lecturer. 18.03 is one of those huge classes where you need to work up a lot of motivation to go to lecture, and having a good lecturer is basically what makes or breaks the class. I’ve enjoyed all the lectures I’ve attended so far, and I think that’s going to make the class a lot easier for me. 6.0001 – Intro to CS Programming in Python: I’m awful at programming under a time limit, so I unfortunately failed the ASE for this class at the beginning of the year. 6.0001 is technically a prerequisite for all Course 6 classes (even though most of Course 6 doesn’t *really* care about prerequisites – shh, you didn’t hear that from me), so I sadly have to get it out of the way. But since I don’t attend lecture or recitation, the class is basically just a mild annoyance to me at this point. I don’t know if I’ve ever talked about fencing in depth on the blogs before (something to do with NCAA rules and regulations), but since Taylor has blogged about basketball, I figured it’s probably okay. 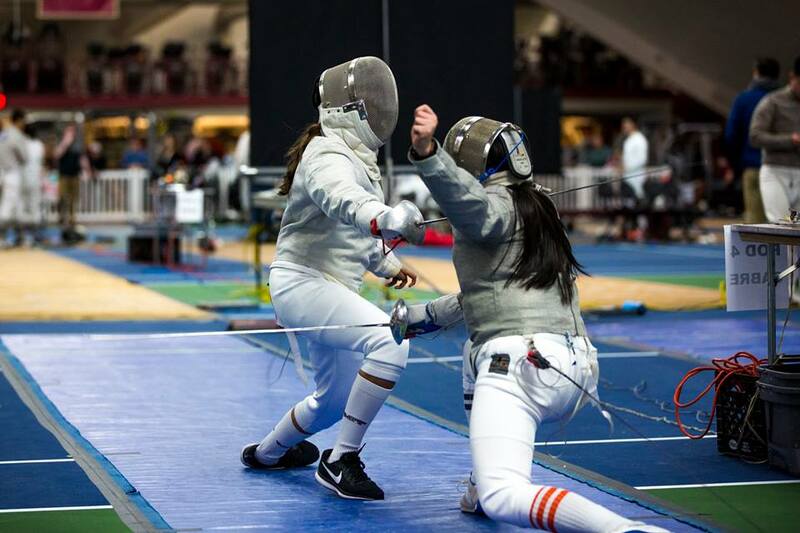 The cool thing is that I had never fenced a day in my life before getting to MIT – I actually got recruited from the saber fencing PE class here. I’m still not what anybody would consider good, but I’ve definitely improved a considerable amount since the beginning of the year. I also enjoy it a lot, even though it’s 10 hours of practice a week – for those of you who are familiar with how saber fencing works, it’s very fast and action packed and strangely well-suited to a small, angry person like me. 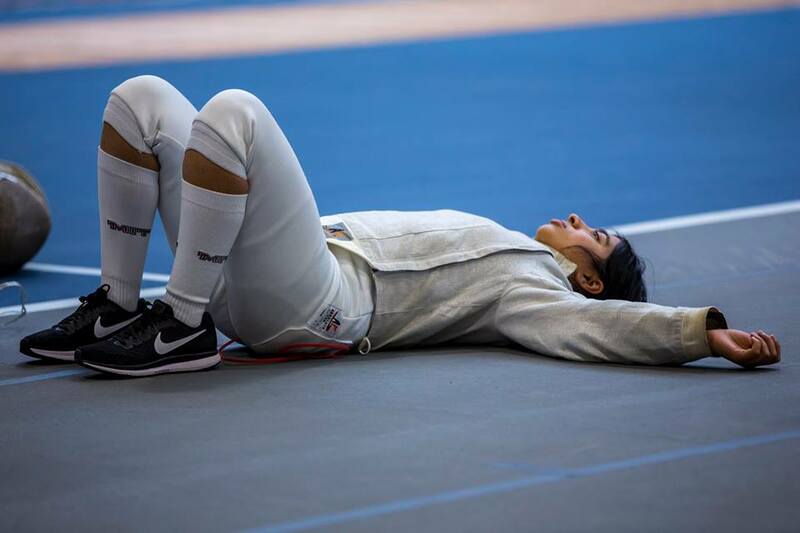 The fencing season is coming to an end, so IAP was pretty packed with practices in preparation for all of the meets crammed into January and February. This definitely sounds like a lot, and it is a lot, but I’m a bit sad that the season is ending. 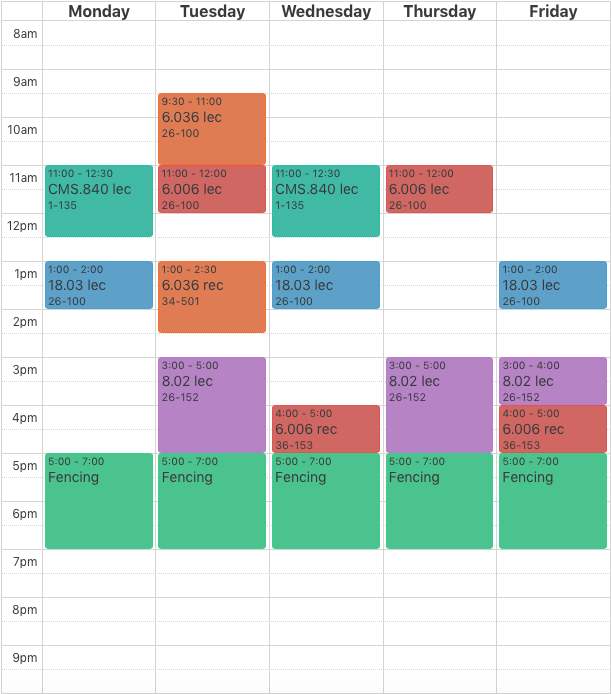 Fencing gives a lot of structure to my day, and once I lose that, I will most likely revert to an unnatural sleep schedule and a very screwed up meal schedule. I’m going to try to keep some sort of exercise routine going after the season ends, but like most things that I plan for, this may not actually end up happening. 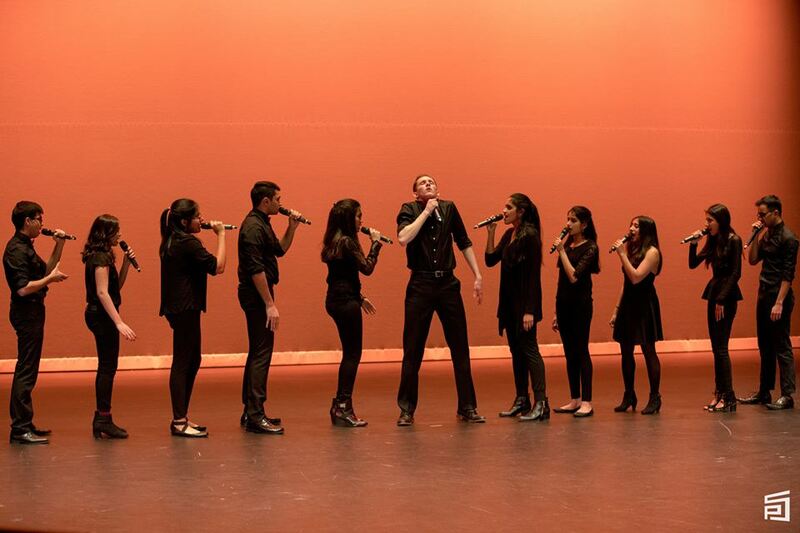 I finally did the thing and joined an a cappella group over IAP! I’ve always really liked to sing, but I never had time for it in high school, so I’m glad that I finally worked up the courage to audition in college. Singing is the best form of stress release for me, and that’s something I’m really going to need this semester. I’m currently on break from a cappella until the fencing season ends, but I’m excited to get back together with my friends and sing at the top of my lungs. I have a really cool UROP at the Scalable Cooperation group at the Media Lab this semester – after a semester of fangirling over the Media Lab, I finally made it in :,) My work involves a lot of the stuff I learned in 6.008 (Intro to Inference) last semester, and even though I wasn’t a fan of the class, it’s cool to apply the material I learned outside the classroom. Life is short/long, and either way, you’re best off spending your time doing things that you care strongly about. Over the past few months, one of the things I’ve realized that I care about is my dorm, East Campus.  I’ve said this on the blogs many times and I’ll keep saying it, but East Campus is by far the best part of my MIT experience, and I’m always going to be grateful that I found such an amazing group of people to live with. So over the past few weeks, I’ve been learning about “joining the swamp” (running for dorm government positions) and have attended a couple of dormwide meetings. Governing is hard, and governing a dorm like East Campus is even harder, but I’ve realized that if I’m going to put my energy and frustration into being involved in anything, I’d want it to be East Campus. I may not reemerge on the blogs again for a while this semester, so until then, wish me luck.